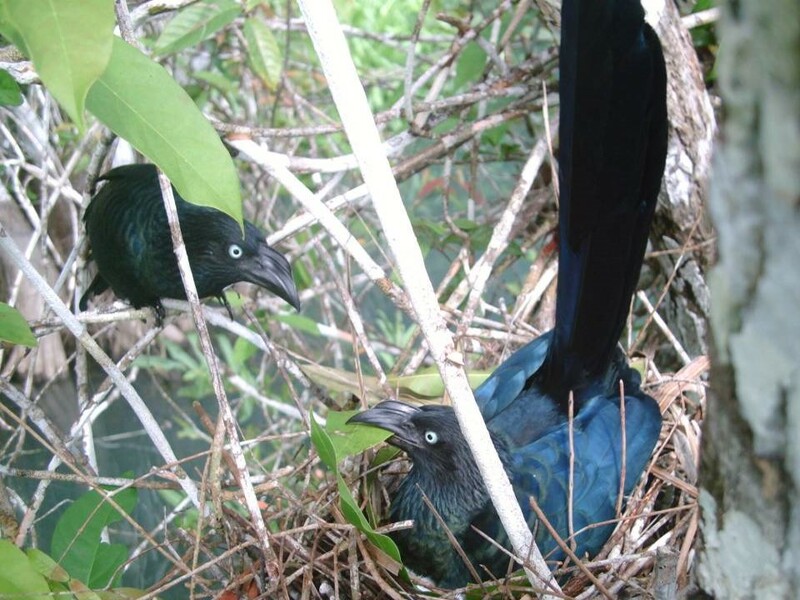 Some birds can avoid paying the costs of parental care by laying their eggs in other females’ nests, while others share those costs by breeding in a cooperative group. 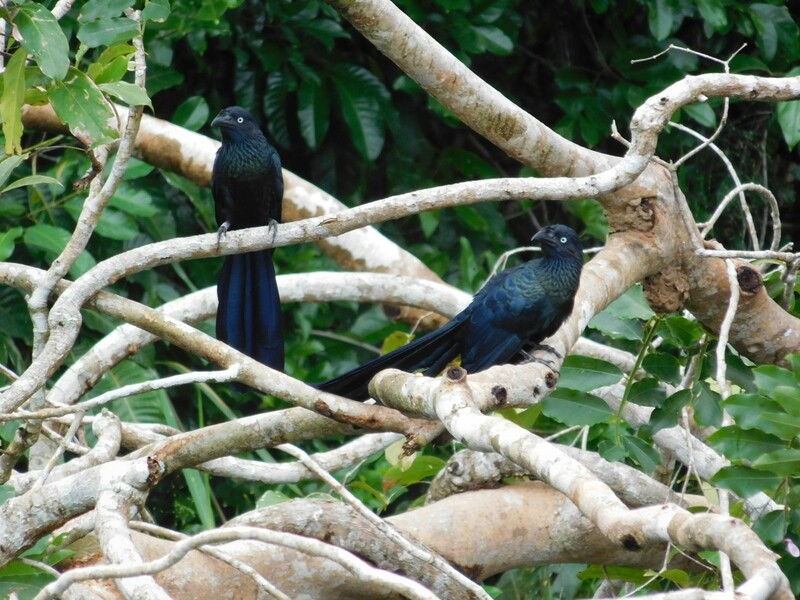 We studied the benefits of both strategies – cooperative breeding and brood parasitism – in Greater Anis, a species of tropical cuckoo. Our goal was to understand why individual females might choose one strategy over another. We found that cheating isn't as easy as it seems, and that female anis typically do it only after their other reproductive options have failed. Greater Anis (Crotophaga major) have notoriously odd nesting behaviors. Groups of anis – typically two, three, or even four breeding pairs – build a single nest in which all of the females lay their eggs. Adults can’t recognize their own eggs or nestlings in the mixed clutch, so each member of the breeding group provides parental care indiscriminately to all of the young. The photo below shows a typical communal nest, containing 10 eggs laid by 3 females. When I first started studying Greater Anis for my Ph.D. dissertation, little was known about this species except that they were communal breeders. I was initially interested in understanding the selective pressures that favored cooperative nesting over independent nesting. What are the advantages of nesting in a group, and why don't Greater Anis ever nest as lone pairs? 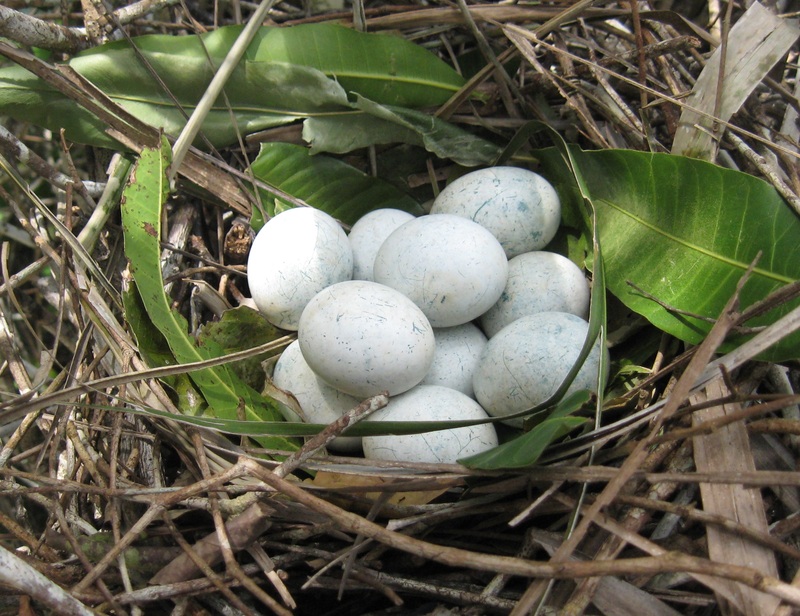 During the course of my graduate work, I tracked hundreds of ani nests along the shores of the Barro Colorado Nature Monument in the Panama Canal, painstakingly recording every egg and nestling in an attempt to measure the reproductive success of individual females. 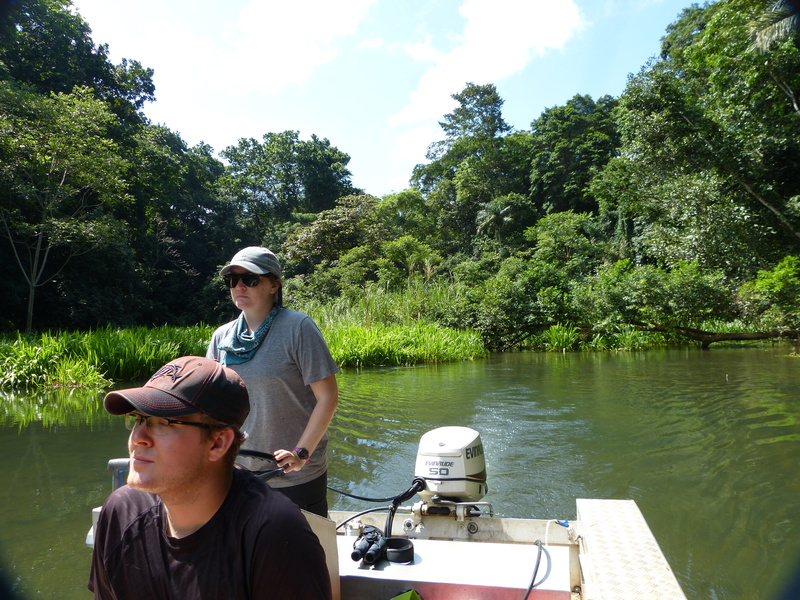 Greater Anis prefer to nest along forested waterways, usually in tree branches that overhang the water or in marshy vegetation, so all of the field work had to be done from a small boat with an outboard motor. Annona glabra (below) is a favored tree for nesting, since they provide a sturdy platform that's safe from terrestrial predators like snakes and monkeys. In order to figure out how many young each female raised, I first had to figure out how to tell which female laid which egg in a communal clutch -- not an easy task, given that the females themselves can't distinguish their own eggs. Instead of using egg appearance, I used maternal DNA on the outside of the egg to genetically assign each egg to the female that laid it. 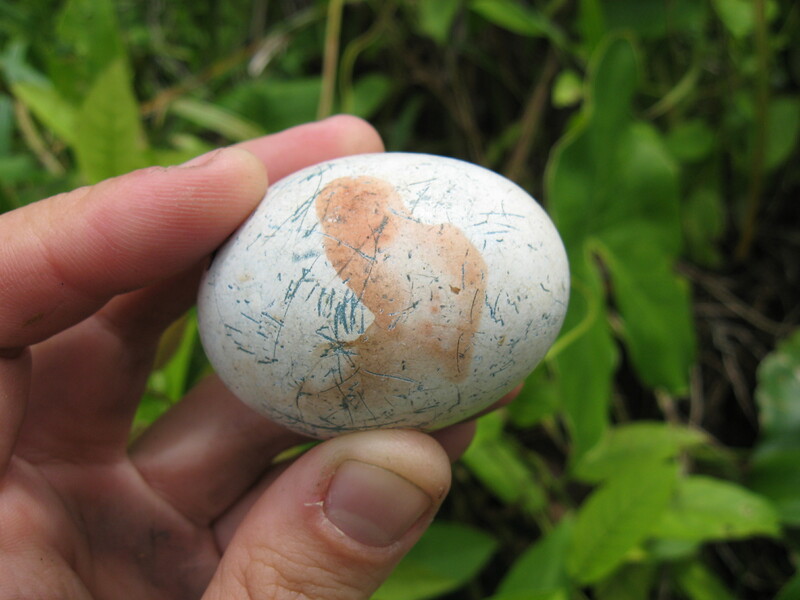 Female anis often leave smears of fresh blood on the eggshell's surface, making it (relatively!) easy to extract small quantities of DNA without damaging the egg (below). The results of my Ph.D. work showed clear benefits to nesting in groups, mainly driven by nest predation. Large groups (three or more pairs) had much lower rates of nest predation than did small groups (two pairs), and lone pairs never nested successfully. Not only did large groups more effectively mob predators, but they also tended to nest in safer nest sites. For reasons we still don't fully understand, large groups seem more likely to nest in emergent vegetation that is completely surrounded by water, a far safer bet than nesting in a shoreline site that is vulnerable to terrestrial predators. In the below photo, a pair of anis hangs out in a fallen tree branch that's now partly submerged in the water (another favored type of nesting habitat; photo credit Luke Carabbia). Interestingly, though, the genetic analyses revealed something I hadn't been looking for: occasionally, an egg would turn up in a communal nest that didn't match the genotype of any of the females in that group. At first, I dismissed these odd eggs as mistakes -- maybe a contaminated sample, or simply an error in the genotyping. But then I realized that there was a pattern to these anomalies. Mismatched eggs often turned up at the "wrong" time, like late in incubation after the clutch had long seemed completed. In some instances, more eggs appeared in the nest on the same day then could have been laid by the female group members -- a clear red flag that something fishy was going on. When I looked at the genotypes of these eggs, I realized that they could often be matched to females in nearby nesting groups. These females had apparently laid an egg in the nest of a neighboring group, but weren't participating in parental care behaviors like nest construction, nest defense, incubation, or provisioning. In other words, they were acting as brood parasites. After my Ph.D., I continued working on the same study population of anis through two postdocs (at the Smithsonian Tropical Research Institute and then at the Harvard Society of Fellows), opportunistically collecting data on parasitic eggs as I continued to monitor the long-term life histories of female anis. I never set out to study parasitism; after all, only about 6% of eggs in this population are laid parasitically, so it would be a pretty labor-intensive study! Rather, the data accumulated over several years as I was tackling other questions related to ani breeding biology. Finally, after about 7 years, I realized that some intriguing patterns were starting to emerge. First, females typically acted as brood parasites after their own cooperative nests had failed (usually when they were depredated during the laying period). Aha! I thought: parasitism must be a best-of-a-bad-job strategy! But the second intriguing pattern was that not all females switched to parasitism after their own nests failed. In fact, most of them simply stopped laying or, rarely, laid a second clutch with the same nesting group. At that point, though, I didn't have a large enough sample size to determine whether there anything could consistently predict whether a "failed nester" would switch to parasitism or not -- much less understand what the overall fitness payoffs of parasitism were relative to the alternatives. It took over a decade, but our data confirm those early suspicions, showing that females typically act as parasites after their own cooperative nests have failed. They also show high individual consistency across years: some females repeatedly act as parasites, whereas others never do. What's more, those parasitic females tend to lay slightly fewer eggs in their own nests than do females that never parasitize. This difference in clutch size, combined with a relatively low rate of survival for parasitic eggs, means that the overall fitness payoffs are about equal for females that parasitize and for those that don't. So I was (sort of) right in my hunch that parasitism is a "best of a bad job" strategy, but the story seems to be more complicated than that. It's not as flexible as I initially supposed, since some females are more likely to parasitize than others (even controlling for predation risk) and the tendency to parasitize seems to be linked to differences in clutch size in the female's own communal nest. To me, one of the most striking messages from the data is that it's not that easy to be a parasite -- or perhaps it's simply that anis aren't very good at it. They tend to dump their eggs into the nearest nest available, rather than searching for one that is at the appropriate stage in the laying period. As a result, parasitic eggs are often mis-timed relative to the host clutch, and they often fail to hatch because the host clutch hatches before the parasitic egg has been sufficiently incubated. Anis are also quite sensitive to the timing of laying, and although they can't recognize individual eggs, they can tell when an egg has been laid too early or too late relative to the rest of the clutch. These mis-timed eggs are sometimes removed by the hosts, or simply left to rot at the bottom of the nest. Parasites also tend to lay very few parasitic eggs, typically just one (rarely two). Why so few? Are they limited by the availability of host nests, by host defenses, or by the low probability of success? We still don't know the answer to that question. Nor do we know what underlies individual consistency in the tendency to parasitize. It could have a heritable genetic component, or it might be solely determined by conditions in the female's early development or experience. Perhaps we'll have the answers in another decade! 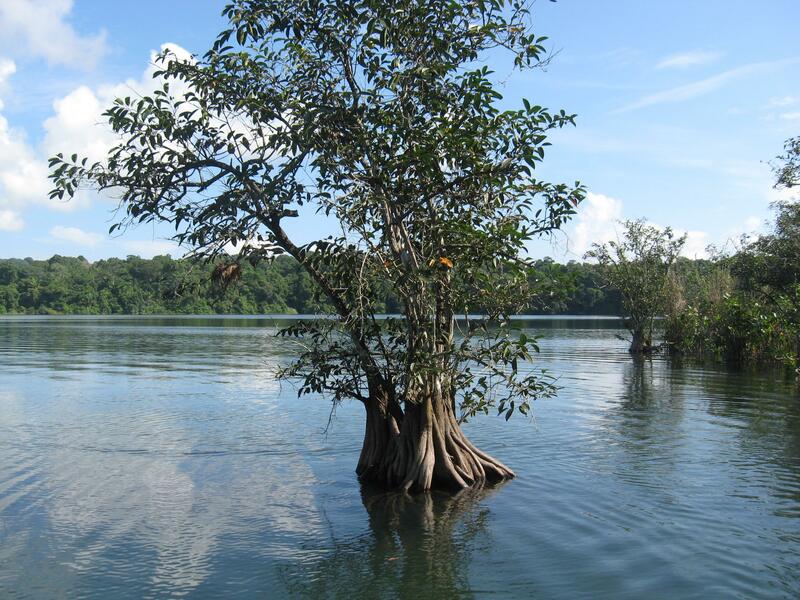 This project was generously supported by the Smithsonian Tropical Research Institute, the Princeton Environmental Institute, the Harvard Society of Fellows, and Princeton's Program in Latin American Studies.